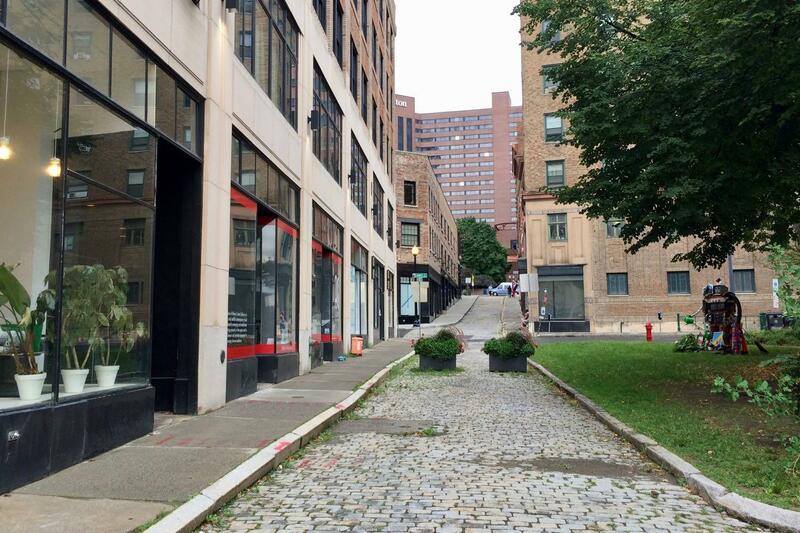 Maiden Lane is one of Albany's oldest streets -- it dates back to the mid 1600s -- with a scale that makes it feel today like it's from a different time. It's also a path straight from the heart of downtown to the pedestrian bridge leading over to Corning Riverfront Park and the waterfront. But the current design and streetscape in that part of town don't really do a good job of communicating those ideas or drawing people in. 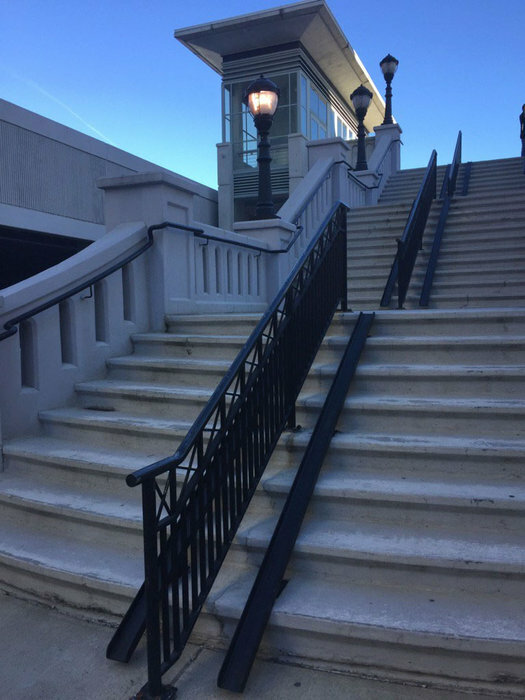 So the city of Albany is looking to change things up. Look over by where the bike trail picks up again just past the boat launch. 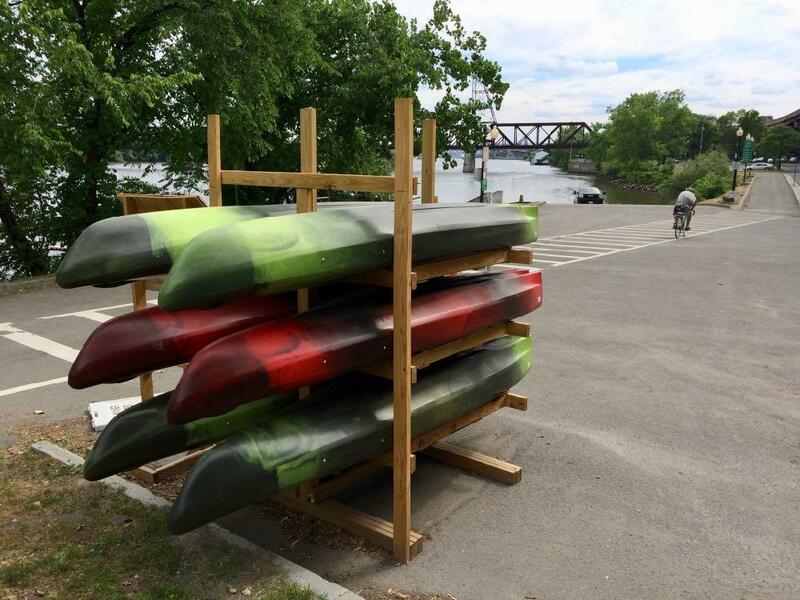 You can now rent kayaks at the Corning Riverfront Park in Albany. Renting kayaks from our Hubs are no different than renting a bike, car, or a kayak from a rental store and transporting it yourself. You are responsible for your own safety and decisions, we are simply providing the equipment in a more convenient manner at different locations for your use. If you do not feel safe paddling in a kayak, please do not rent our equipment. Our Kayak Hubs are meant for paddlers who are comfortable being on the water and familiar with boating safety. It is always recommended to start your excursion up stream if paddling in a current. And please paddle close to the shore lines, especially if you see large vessels approaching. Each Hub consists of a rack of 6 locked kayaks which are available to rent to the public 7 days a week, in 1 1/2 hour intervals (plus an additional 15 minutes to clean and lock up equipment). In order to access our kayaks, renters will need a smart phone with Bluetooth and the ability to download a free App to unlock the equipment. The kayaks are rented in pairs, the company says life jackets must be worn at all times. It's $50 for 1.5 hours (plus 15 minutes for cleaning up and locking up). The fee includes life jacket and paddle rental. 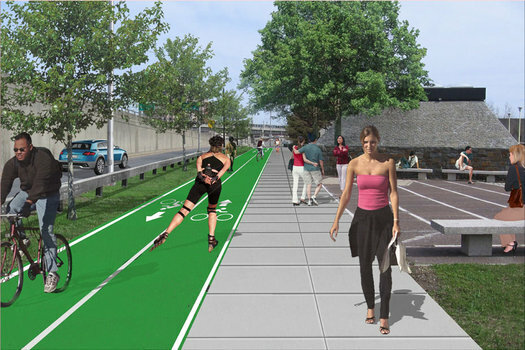 Some quick photo follow-up on the pedestrian and bike upgrades project at the Corning Riverfront Park in Albany. This is the $5 million project that was under construction last year, and prompted the move of Alive at Five to Broadway last summer. 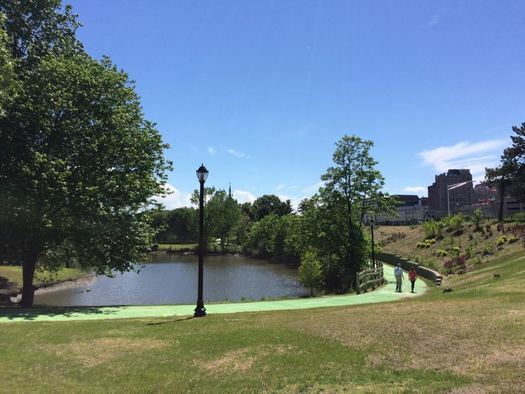 The goal of the upgrades was to widen the (now vibrantly green) multi-use path through the park, provide a route for through walkers and bikers to bypass events in the park by going along the back of the tidal ponds, and making it easier for people to find connections between downtown and the park. A rendering of the proposed park. Updated with comment from NYSDOT. 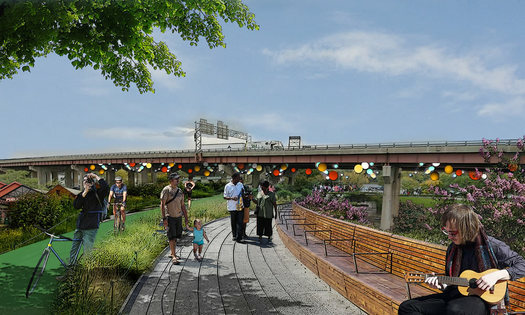 One of the more intriguing Capital Region projects to pop up in the state's Regional Economic Development Council funding announcements this week is a linear park that would take over an off-ramp that connects currently connects Quay Street along the Albany riverfront to Clinton Ave downtown. Corning Riverfront Park -- wedged between I-787 and the Hudson River -- has always been like a stray puzzle piece for the city, with people looking at it, scratching their heads, and asking: "How does this fit?" It took the city decades to figure what to do with the slice of land. Should it exist as a nature preserve? Maybe farm land? If it's an active park, what should it include? More than anything, though, the spot has just been persistently difficult or confusing to reach. It is the place in Albany that you can't get there from here. But now there's a $5 million project aimed at upgrading pedestrian and bicycle amenities in the park -- and making it clearer how exactly it connects to other parts of the city. He also posted a bunch of photos. B posted a few, too. Tweet of the night from @kcampbell: "Alive At Five recap: waited in line, Mayor Jennings said Hi, couldn't hear music, saw woman with a Red Bull can nestled between her cans." Alive at Five series starts up again June 4 at the Corning Preserve. 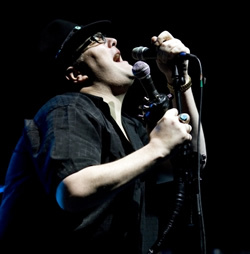 A few notables from this year's lineup: Blues Traveler (that's singer John Popper on the right) and... the Village People.